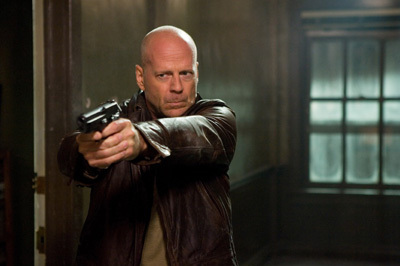 Well.. so this Sunday morning was dedicated to Bruce Die Hard Willis. So what if this is the fourth time the DH camp has pulled off something which reminds me of what a classic action movie should be like. After the first 5 mins, where a rugged and troubled Bruce Willis is trying to save his daughter from the clutches (literally) of her not-boyfriend, the movie gets into some real traditional way of fighting (so reminding me of our good ol Sunny Paaji) where a hero cannot be killed, come what may! But in case I am sounding satirical or sarcastic, let me retract my tone. I loved every minute of the movie. Not the way I love a Gunda or a Sivaji. Not the way Jaspal Bhatti won an award for the best comic serial when he was trying to make a tragedy serial (in one of the episodes of flop show). 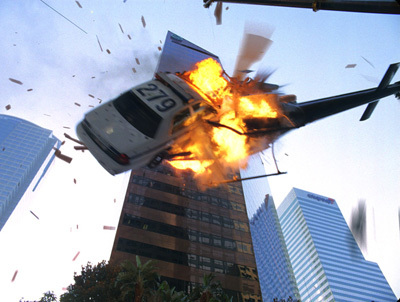 DH4 is a perfect action movie, the way I love them. What I fail to understand though is that a four-time Die-hard cop of NYPD (New York – The Big Apple? the land of dreams, a nation that believes in taking good care of its peepool) having a horrid time despite saving hudreds of people and the holy country amrika all the time.. No gratitude, eh? Anyway, Bruce Willis is back. His witty cracks, crude action, blood and gore, against an all pervasive villain, a nation not able to think what to do, armed with a gun, a few cartridges, and a hacker who has all the right tricks up his sleeve. Perfect setting. I love such movies. Oh, I am trying hard to think of something. But the fact is that I have nothing to say! Its a good action movie. You SHOULD watch it if you love action movies. Its a good rush of adrenaline! Note : Can’t really say if things are improving with this version control thingy! 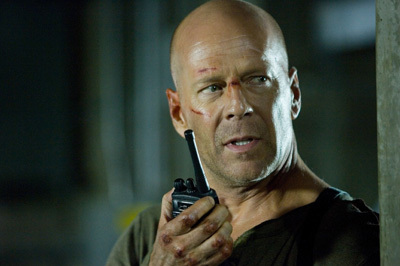 I wonder Die Hard (5) will be called. Die harder than the hardest? Die hardest with a vengeance? duh.. I give up! make it as nice, and I will go watch! Yo! 100MM Dollars is the budget! in INR terms, it becomes 400 crores!! Rajni would have been able to get his fee.. and India would have gone crazy!! and Bruce is just not as stylish..
Rajni as hero in Diehard.. hummmmm Sreejith.. I was literally screaming my lungs out during the action scenes which is pretty much the entire movie. Imagine how crazy india would go if Rajni had been the hero in Die Hard 4! !